FOOTBALL: English media heaped praise on Gareth Southgate’s team for reaching the World Cup semi-finals and told the country to cancel plans for Wednesday evening when they face Croatia seeking a place in the final. The Sunday Mirror paraphrased the song written when England hosted the 1996 European Championships, saying: "England are in the World Cup semi-finals – could this really be the summer football comes home?" "If we were to be picky, a legitimate argument could be made that England will need to play with more finesse if they are to harbour serious ambitions of winning this competition." The Sunday Telegraph said Southgate "has liberated England and now the country's ambitions ought to be higher than 1990" when they last appeared in a semi-final, losing to West Germany. The paper compared Southgate to the England coach 28 years ago, Bobby Robson. "The similarities between Southgate and the late Sir Bobby are striking. Both are synonymous with modesty, consideration and togetherness. "Like Robson, Southgate has struck gold by playing three at the back and encouraging freedom of expression while backing youth." England's progress earlier in the day was much more serene. 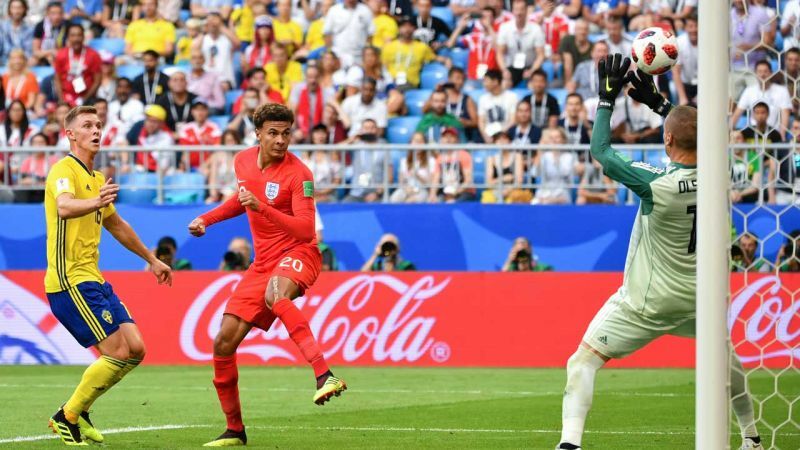 Leicester defender Maguire headed in the opener from a corner on 30 minutes -- England's eighth goal from a set-piece at the World Cup -- with Alli adding a second, also from a header, just before the hour. The tournament's leading goalscorer Harry Kane failed to find the net for the first time in the competition, but the England captain said confidence was high after posting the country's best run at a major tournament since Euro '96. The party began with beer showers and chants of "Football's Coming Home" -- England's unofficial football anthem written for the Euro '96 tournament. "You wanted to make history @England and you are doing just that," he tweeted. "This has been an incredible #WorldCup run and we've enjoyed every minute. You deserve this moment – Football's Coming Home!"